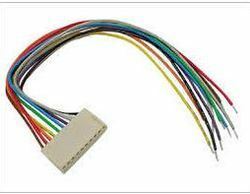 Our organization have been actively engaged in manufacturing and supplying a premium quality Durable Wiring Harnesses in Faridabad, Haryana, India. The offered harness is manufactured using rich grade raw material and advanced manufacturing techniques. These are made in adherence with industrial quality guidelines. These harnesses are strictly analyzed by our skilled professionals. Our precious clients can avail these Durable Wiring Harnesses from us at rock bottom prices. Manufacturer of wiring harness, washing machines etc.